Children with disabilities have the right to an education like any other students and deserve the same quality of education. In order to achieve this equality, Canadian provinces and territories have policies in place to ensure students the opportunity to achieve equal educations, but these policies vary from coast to coast. 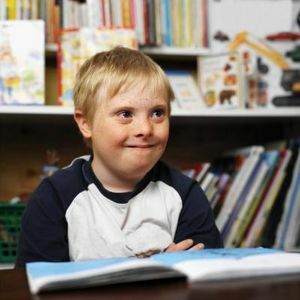 Often it is parents who provide the school with the information about their child’s disabilities in order for their children to receive the proper care and education. Problems range from chronic conditions (epilepsy, spinal bifida or muscular dystrophy) to physical cognitive and emotional disabilities. The mix varies with each student, so the education providers need to be trained in all areas and aspects in order to allow their students to receive a full and equal education. The more wide-spread disabilities include physical difficulties in hearing, seeing, speaking and/or walking and cognitive or emotional disabilities which can cause difficulty in learning, such as dyslexia and the more serious disorders such as Down Syndrome and autism¹. Just like their fellow students, sitting alongside them in the classroom, each learns differently and at differing rates. This is why hihgly qualified teachers are needed, especially for those who work in special education. 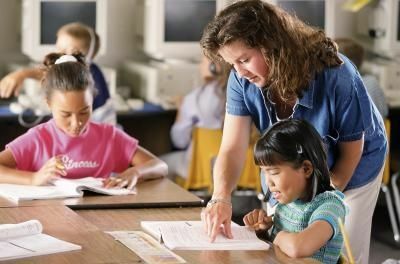 Teachers need to be prepared and devoted to offering equal help and instruction to all of their students, whether it be in a regular classroom or in a special education classroom. According to teh 2001 Statistics Canada’s Participation and Activity Limitation Survey (PALS), there are an estimated 155,000 Canadian children between the ages of 5 and 14 with some form limitiation. In this survey, parents were given a range of intellectual, behavioural, and physical conditions that can affect children at home, at school and at play, and they were asked to indicate how their child might be limited. Parents were also asked about their needs for special education services and whether these needs were being met ². The use of special education classes varied by province. 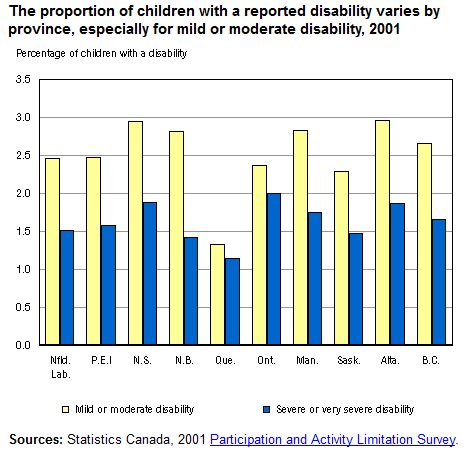 The national average is 59% of students with disabilities are in regular classes, but the range went 73% in Prince Edward Island down to 48% Quebec. One-third of parents with children who have disabilities reported difficulty in receiving proper special education services. Many parents in each province also believed that their children, particularly those who with cognitive or emotional disabilities, found that their children were not being challenged to meet their full potential ³. Everyone deserves an equal education whether you be the jock, the most popular girl, the library nerd or the kid with the extra chromosome. There should never be a discrimination in the quality of an education that is available for Canadian students to receive. Education is a right!